The Texas tort system faces an inevitable surge of litigation arising out of participation in sports and recreational activities. Thus far, Texas appellate courts have forged their own means of handling such cases through the use of the “competitive sports doctrine,” known elsewhere as the reckless-intentional standard. Although a recent feature of Texas law, the reckless-intentional standard is grounded in the old common law doctrine of assumption of the risk. The Texas Supreme Court abolished the affirmative defense of assumption of the risk in 1975, and has repeatedly criticized its rebirth as the competitive sports doctrine. On several occasions the Texas Supreme Court signaled its interest in considering other liability standards to be utilized in adjudication of cases involving sports injuries, but it has not yet so acted. In the event that it did choose to act, it is similarly unclear what its choice would be. 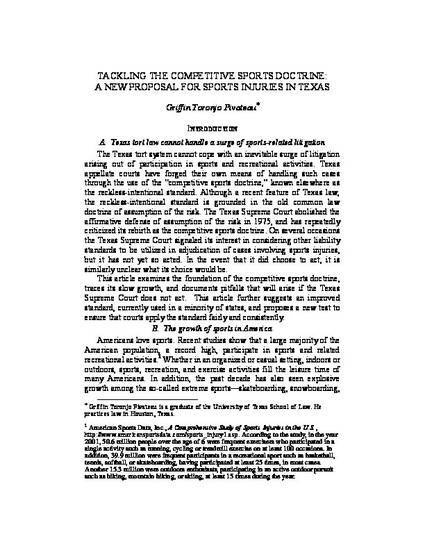 This article examines the foundation of the competitive sports doctrine, traces its slow growth, and documents pitfalls that will arise if the Texas Supreme Court does not act. This article further suggests the use of the inherent risk standard, currently used in a minority of states. The article also proposes a new test to ensure that courts apply the standard fairly and consistently.